Judging from the title of Adieu au langage (2014), Jean-Luc Godard’s extraordinary 3D film, the director apparently intends to say goodbye to the language of film as we know it. However, as one has come to expect of Godard, things are not quite as simple as that. In a video interview on the film, Godard has explained that in the French-speaking part of Switzerland where he lives “‘adieu’ veut dire ‘bonjour’ aussi” (Mella 2015) – ‘goodbye’ also means ‘hello’. This implies that Godard is not merely saying goodbye to the language of film, but that he is simultaneously saying hello to a new language of film. Fig. 1. Godard already proclaimed the end of cinema in 1967’s Weekend with this famous intertitle. Looking back at the director’s oeuvre, Adieu au langage is certainly not the first instance of Godard saying goodbye. 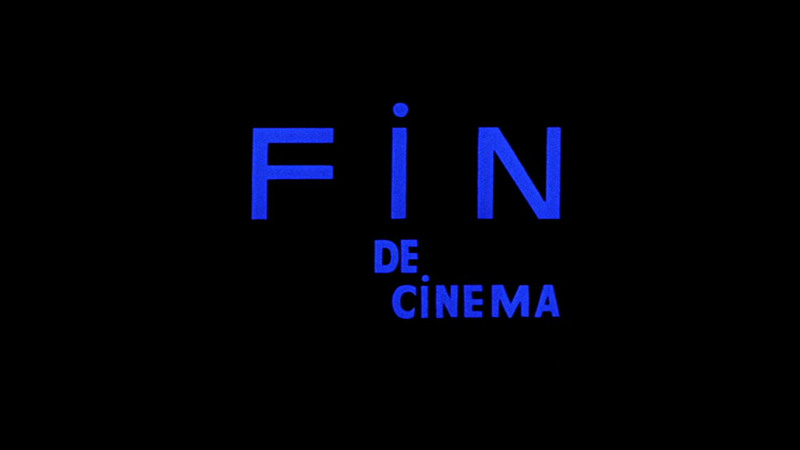 Particularly his 1967 film, Week-end (1967), has also become known as an ”obituary of film language” (Rasmussen 2006: 95, my translation), as epitomized in the final provocative intertitle that declares “Fin de cinema” – the end of cinema (fig.1). Not surprisingly, the film that has most consistently been compared to Adieu au langage is precisely Week-end (see for instance Ross 2014 or Knight 2014). In the literature on Godard, this film is often considered the final film of the first phase of Godard’s work – marking the end of one part of his oeuvre and the beginning of another. Wheeler Winston Dixon has claimed, for instance, that Week-end “is the beginning of the end, the jumping-off point into an entirely new form of cinema” (Dixon 1997: 89), while Douglas Morrey also points to the years 1966-67, and particularly Week-end, as marking “a crucial transition in Godard’s career” (Morrey 2005: 71) in a chapter appropriately titled “End of the beginning / Beginning of the end: 1966-67”. In much the same way, Adieu au langage also feels like a possible turning point in Godard’s work, being at once a culmination and a fresh start. 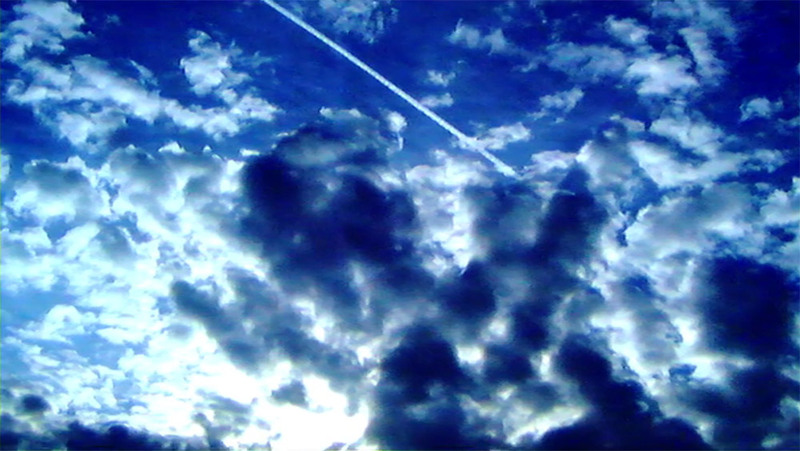 On one hand, the film operates in continuity with Godard’s previous work, featuring many Godard trademarks, such as its use of images of nature (figs. 2-3), its unconventional use of sound, its characteristic intertitles, its opposition between word and image (to which the “adieu” of the title perhaps also alludes), its constant allusions and references to other works, its stylistic inventiveness, and its impenetrable narrative (see Bordwell 2014 for a narrative analysis of the film and Neupert 2002: 235ff on “dysnarration” in Godard in general). On the other hand, in its employment of 3D the film also marks a radical left-turn in Godard’s career (this being, paradoxically, something of a convention when it comes to Godard), even as he had already experimented with 3D the year before in the short film Les trois désastres (2013), also reusing some of the footage from this film in Adieu au langage. By investigating how Adieu au langage partakes in two different cinematic histories – the history of the cinema of Godard himself and the history of the 3D film – this article sets out to explore the exact ways in which the film shapes a new cinematic aesthetic of 3D, ultimately arguing that it at once points to a potential crisis of the 3D film as well as its radical artistic possibilities. Fig. 2. 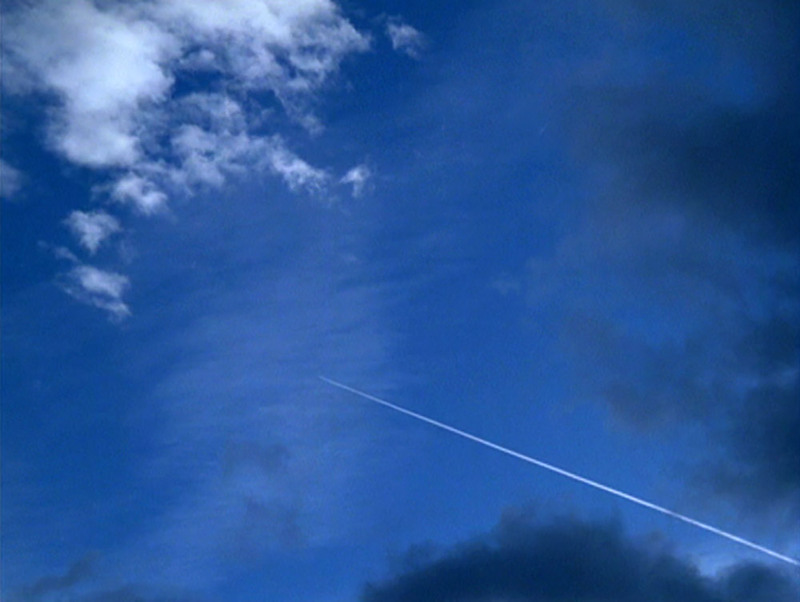 A typical image of nature in Godard: the contrail of an airplane against a blue sky in Passion (1982). Fig. 3. A replication of the image from Passion in Adieu au langage. In the aforementioned video interview, Godard explains that part of what drew him to 3D filmmaking was the very lack of rules: “il y a pas de règles” (Mella 2015). Nonetheless, the film has become known for its tendency to break all the unwritten rules of 3D cinematography. As Bryant Frazer has noted, the film breaks (at least) five conventions of mainstream 3D cinema by (1) not keeping a clean frame, (2) employing low-quality cameras, (3) gravitating toward deep focus, (4) letting the two 3D images go their separate ways, and (5) elevating the mundane (Frazer 2014). The film employs many different strategies in order to complicate the 3D effect. In addition to the things mentioned by Frazer, one could add: the use of handheld cameras and shaky imagery; the use of pixelation and other kinds of digital noise; the use of light sources pointing directly towards the camera; the use of unusual camera placements, spiraling camera movements and dutch angles; the use of haptic close-ups of textures and surfaces, including many images of rippling water; the use of 2D archive footage; the use of reflecting surfaces as a recurrent motif, for instance the rainy windshield of a car, sometimes including wipers and washer fluid; and the placing of objects or texts in front of other objects or texts (figs. 4-9). Fig. 4. The pixelation of the images disturb the 3D effect. Fig. 5. Light is often pointed at the camera. Fig. 6. 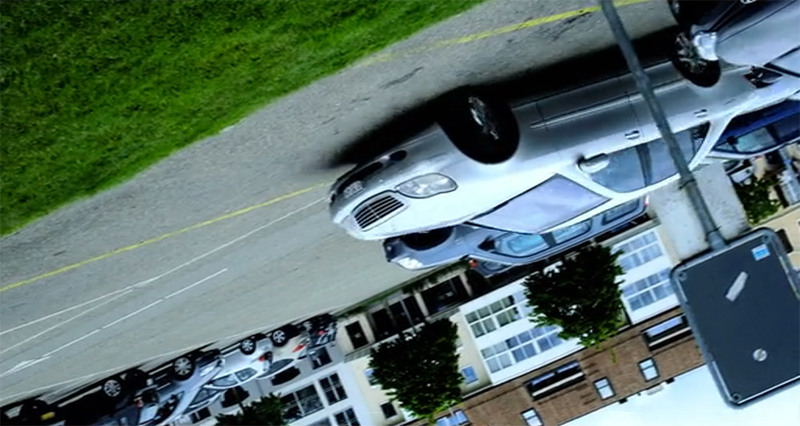 At one point in the film the camera is placed upside down. Fig. 7. 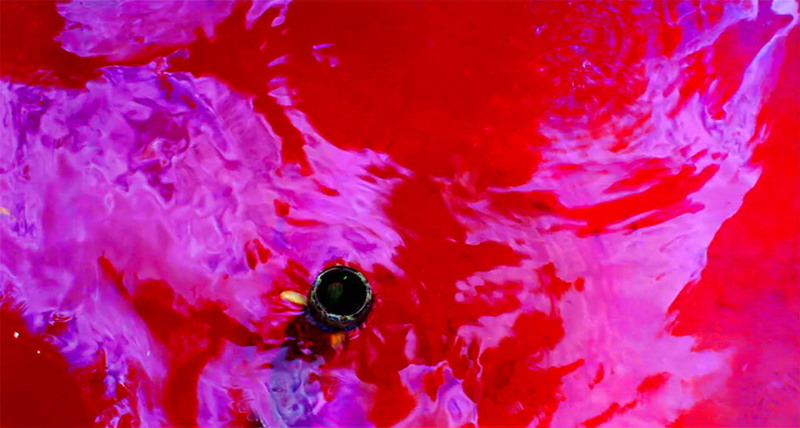 The film frequently depicts rippling water, here mixed with blood. Fig. 8. Windshield, wipers, washer fluid. Fig. 9. Godard frequently places objects in front of other objects. The use of 3D in the film thus constantly challenges the viewer’s capacities. When watching the film, I regularly have to readjust the 3D glasses, as also noted by Jonathan Romney who speaks about the way that the diversity of the images forces you “to constantly adjust your receptivity” (Romney 2014). The film’s strenuous 3D effect has also been central to the critical reception of the film. Romney talks positively about the film’s “sheer assaultive power” and points out that “Godard’s recent work can be a source of joy, but also of terror” (ibid.) while Erwan Debois similarly classifies the film as “film terrorism” (Debois 2014, my translation). This aspect of terror also seems to inform 3D scholar Miriam Ross’ reaction to the film as she calls the film “both fascinating and almost completely unbearable”, noting how “sight becomes painful” (Ross 2014) – and judging from the tone, Ross does not simply mean this as a compliment. I would argue, however, that this painful 3D effect is the film’s very accomplishment and precisely what makes it an interesting film to study. Concerning the two histories traced in this article – that of the cinema of Godard and of 3D cinema – the film assumes a quite natural position in the first history due to its many typically Godardian traits while it assumes a marginal – but not at all unimportant – place in the history of 3D cinema. As a Godard film, Adieu au langage clearly resonates with what has gone before. It has become rather common to think of Godard’s career to consist of four phases: the New Wave phase, the Dziga Vertov phase, the video phase and the late Godard’s ‘return’ to cinema (see for instance Sterritt 1999: 35). 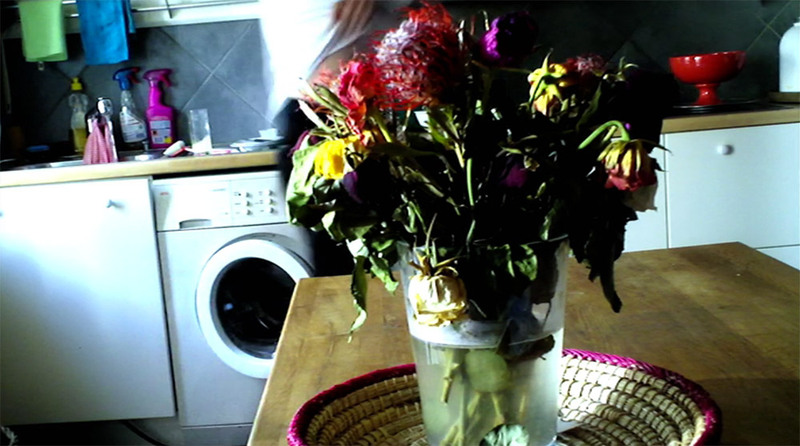 As often noted in the scholarship on Godard, it is a common view that the last of the four phases has marked a (further) creative decline in his career with people commonly expressing a “dissatisfaction with Godard’s late films and videos” (Morgan 2012: 8) and a “complaining of ‘too many images’” (Sterritt 1999: 2). In this light, Adieu au langage marked a surprise return to form to many commentators, even as it shares quite a few traits with other of Godard’s late films (Daniel Morgan identifies five traits that characterize late Godard which also fit partly with Adieu au langage, for instance making claims and arguments about film and film history or the use of images of nature – see Morgan 2012: 9-11). As a 3D film, however, Adieu au langage does not resonate clearly with what has gone before. Incidentally, the history of 3D cinema has also been said to consist of four phases, according to 3D historian Ray Zone: a novelty period (1838-1952), an era of convergence (1952-1985), an immersive era (1985-), and a digital age (2005-) (Zone 2007: 1-4) – of which the 1950s films and the current wave of digital 3D are normally seen as the most significant. Where the 3D films of the 1950s, starting with Bwana Devil (1952), are frequently said to have used 3D mostly as a spectacular gimmick in frequently making things protrude from the screen in negative parallax, contemporary 3D films mostly reserve the use of negative parallax for moments of special narrative significance or for action scenes. Certainly, some contemporary 3D films use 3D mainly to add an increased sense of visual depth and immersion, keeping the use of negative parallax to a minimum. Moreover, 3D has been most consistently used within Hollywood films belonging to certain film genres that are far removed from Adieu au langage, particularly animation (for instance, Bolt (2008), Monsters vs. Aliens (2009), Toy Story 3 (2010), Tangled (2010), How to Train Your Dragon (2010) and several others), as well as fantasy, sci-fi and superhero movies (for instance, Beowulf (2007), Avatar (2009), Transformers: Dark of the Moon (2011), The Hobbit trilogy (2012-2014), The Avengers (2012), Jupiter Ascending (2015), Jurassic World (2015), Star Wars: The Force Awakens (2015) and several others). Several of the films in the latter category were shot in 2D and converted to 3D only in post-production and released in both 2D and 3D versions – indicating that the use of 3D is perhaps not even essential to the films in question, but mostly an afterthought or a surplus value. As such, current mainstream 3D practices have been accused of doing “nothing more than adding a depth veneer to an existing film” (Atkinson 2011, 149). Compared to these films, Adieu au langage, uses 3D in a decidedly non-immersive fashion. At the same time, it does not seem to simply return to the more gimmicky use of 3D in the films of the 1950s, but rather does something altogether different. Some of the films mentioned above use 3D in a surprisingly minimalist way. Take for instance a sci-fi film such as Jupiter Ascending, directed by the Wachowskis. Much of the film takes place in space and features energetic chase scenes and incessant movement. 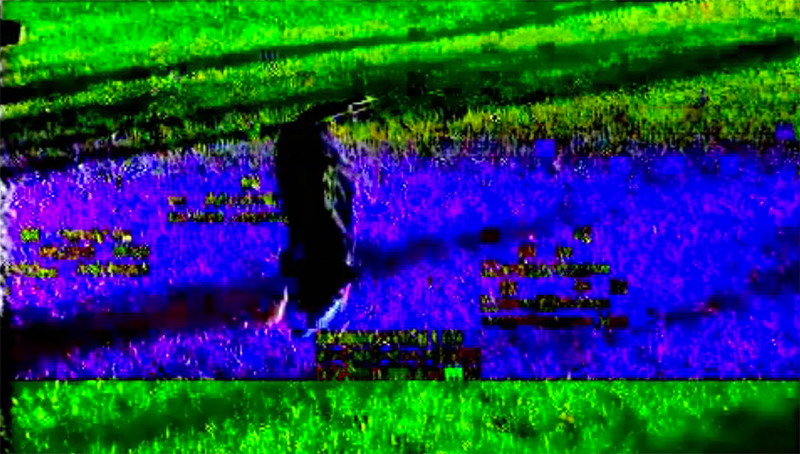 As such, it seems to be a film perfectly suited for what Geoff King has termed an “impact-aesthetic” characterized by rapid editing, unsteady camerawork, and thrusting objects in the face of the viewer (King 2002: 246). However, Jupiter Ascending more or less fully resists this temptation to fling objects at the viewer when it comes to its employment of 3D as it features almost no moments of negative parallax, opting instead for a more sparse and less intrusive use of 3D that mostly serves to increase the visual depth of the image. Fig. 10. The lack of cuts during the first 17 minutes of Gravity lets you get used to the 3D effect as you do not have to constantly readjust to a new perspective. Another 3D film taking place in space, Alfonso Cuarón’s Gravity (2013), is one of few contemporary movies to have been highly praised for its use of 3D, with most critics agreeing that it was “the rare movie that’s really worth splurging extra to see in 3D” (Susman 2013). However, even this movie that appears to have been thought out in 3D and to make a both sophisticated and motivated use of it stands in striking contrast to the way Godard uses 3D. The use of 3D in Gravity mainly supports an aesthetic of visual immersion, as the 3D effect becomes naturalized by a limited use of moments of overt negative parallax and an insistence on long takes that make it easy for the viewer to get used to the 3D-effect in each shot (fig.10). In comparison, the denaturalized use of 3D in Adieu au langage does not support immersion, but rather creates a heterogeneous and unstable visual space. This unconventional and imperfect use of 3D appears wholly deliberate. At one point in the film, one of the male characters appears to lend his voice to a formulation of what could be the very intention of the film: ”Je cherche la pauvreté dans le langage” (“I search for poverty in language”) (fig. 11). Undeniably, the film often makes intentionally “poor” use of 3D. But herein lies not only a poverty of language, but also a certain richness. As already mentioned, the film overwhelms us with many different kinds of imagery and very different uses of 3D. In a sense, then, what does indeed separate the film from other contemporary 3D films is that it contains “too many images”. Fig. 11. 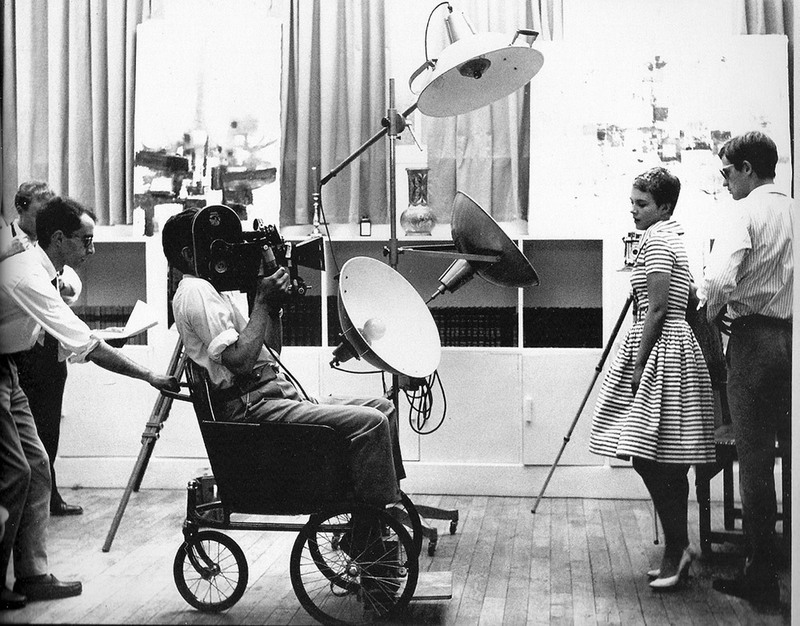 Adieu au langage continues Godard’s history of self-imposed aesthetic ‘poverty’ – here he is pushing Raoul Coutard in a wheel chair on the set of À bout de souffle. Nowhere is this more apparent than in the most striking moments in the film where the two images that come together to create the illusion of 3D are suddenly torn apart. The left eye is watching one image, the right eye another. This happens twice in the film and it reportedly “elicited bouts of applause at the film’s premiere screening at Cannes” (Fairfax 2015). By far the most radical feature of the entire film, this effect of tearing the 3D image apart has not gone by unnoticed in the reactions to the film. The film’s cinematographer, Fabrice Aragno, has referred to it as “a reconstitution of the image” that “hurts a bit when you watch it” (quoted in Dallas 2014: 39). Others have also pointed to it as perhaps the defining facet of the film, calling it anything from “a mindboggling, eye-dislocating, narratively profound sequence” (Taubin 2014: 48) to “a hallucinatory, unstable superimposition effect impossible to replicate in a two-dimensional image” (Fairfax 2015). Fig. 12. The radical tearing apart of the 3D image is impossible to replicate in a 2D image. The very fact that the effect is impossible to replicate in 2D (fig. 12) says much about the film’s transformative use of 3D when compared to the films mentioned above. Godard does not seem content to use 3D as a means to replicate or amplify what is already possible in 2D cinema – that is, mostly as a means to increase the sense of visual depth. Instead, 3D is used to violate our very conception of what an image even is. The moments where the two images are torn apart, our left and right eye watch entirely different images producing an affect somewhat akin to superimposition, making us fully aware that any time we are watching 3D films, we are in fact looking at two slightly different images simultaneously. Apart from being visually overwhelming and confusing, the separation is perhaps the film’s most vivid demonstration of how it contains “too many images”. These sequences contain more visual information than it is possible for the viewer to take in, apparently often provoking viewers to close one eye in order to exclude one of the two images (see for instance Bailey 2014 or Bordwell 2014). This is, however, not the only way in which the movie contains more information than it is possible to handle. Like so many other Godard films, Adieu au langage contains an overabundance of allusions and references to works of art and philosophy. The film almost manically references each and every art form, including cinema (from Lang’s Metropolis (1927) to Aja’s Piranha 3D (2010) (fig. 13-14), literature (from Shelley’s Frankenstein to Solzhenitsyn’s The Gulag Archipelago), visual arts (from Monet to Rodin’s Le Penseur), and music (from Beethoven’s Seventh to Schoenberg). The wealth of quotations combined with the wealth of images add up to generate extremely complex layers of meaning that are at times impossible to process and untangle. The complexity of meaning only increases once you add in the soundtrack that often goes its own ways, the intertitles and the frequent visual and linguistic punning (the film’s title rephrased as “ah dieux, oh langage”, or two children playing with three dice, or in French “trois dés”, a homonym for “3D” (fig. 15.)). Certainly, Godard’s use of sound in Adieu au langage is as decidedly non-immersive as his use of 3D: noise, music and dialogue constantly intermingle and overlap, sounds are sometimes abruptly cut off, and there are also sudden shifts in volume. As such, the use of sound also contrasts the mainstream intelligibility of sound in contemporary 3D films. Fig. 13. The scene from Metropolis where Rotwang chases Maria is replayed on a screen in Adieu au langage. Fig. 14. 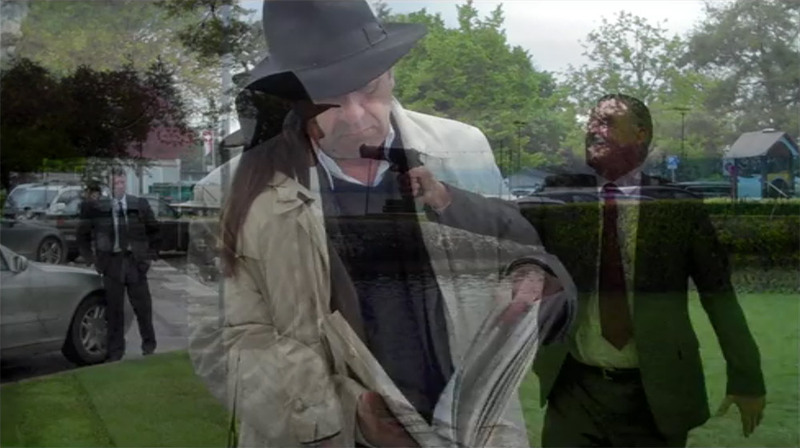 Just like Godard’s short 3D film Les trois désastres, Adieu au langage also includes footage from Piranha 3D. Fig. 15. 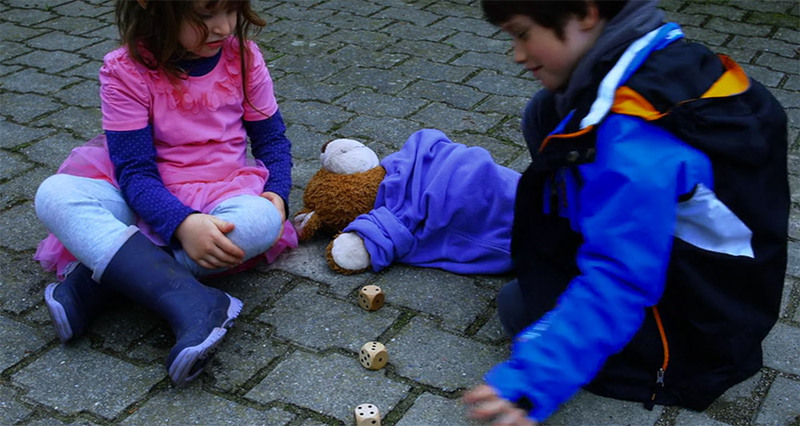 Two children play with trois dés while Godard plays with 3D. Arthouse 3D – an Oxymoron? As a 3D film, the film is one-of-a-kind – a violent attack both on the conventions of the mainstream 3D film and on the viewer. Adieu au langage also seems to ignore the fact that negative parallax (images extending outward from the screen) is normally a faux pas when it comes to “serious” uses of 3D (see Barbara Klinger on the tendency to dismiss negative parallax as “exaggerated and campy artifice” (Klinger 2013: 425), Barbara Flueckiger on the conception of negative parallax as “a cheap gimmick” (Flueckiger 2012: 103) or Miriam Ross on the tendency for overt negative parallax moments to “detract from or disrupt film narratives” (Ross 2013: 411)). The film clearly opposes the mainstream tradition of using 3D techniques as “workhorses in the realm of classical storytelling” (Klinger 2013: 428). Instead, 3D is used to make us constantly aware that the film is exactly a 3D film. That Godard sees himself in opposition to the mainstream conventions of 3D is also manifest in the precursor to Adieu au langage, the short film Les trois désastres. Towards the end of the film (around the 15:30 mark) Godard’s voice-over calls out “Le professeur de Titanic” – that is, James Cameron the director of the highest grossing 3D film thus far, Avatar (2009) – seemingly not in order to pay homage, but rather in order to criticize his use of 3D (Titanic was re-released in 3D in 2012…). In almost every possible way, Adieu au langage is the opposite 3D film of Avatar. Less immersive in its use of 3D, less reliant on classical storytelling, less American (and more French), made on a lesser budget to a lesser audience – indeed a poverty-stricken 3D film. But nonetheless, perhaps the film can tell us just as much about the current status and possible future of the 3D film as Avatar can. Fig. 16. 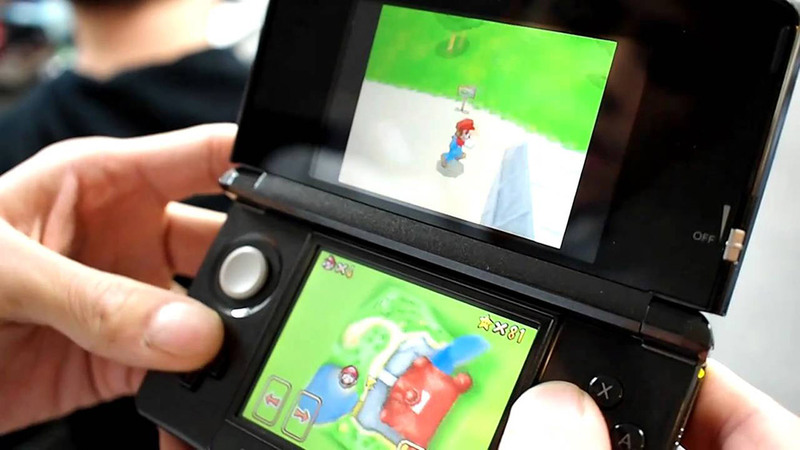 The Nintendo 3DS is but one example of a common small 3D screen. There are two opposing theses afloat about the condition of the 3D film: (1) It is the “new normal”, destined to push 2D to the margins. (2) It is (always) already dead. Both positions have looked to the history of 3D for arguments. Those claiming that the 3D film is dying point to the past failures of 3D films and technologies, most notably in the 1950s, and the inevitability of the current wave of 3D films to share the same fate. Those claiming that the 3D film is finally catching hold point to the fact that 3D was never gone in the first place and that it actually has a longer history than is often believed – in fact, Zone has even claimed that “[s]tereography preceded photography” (Zone 2007: 4). Those arguing for the survival of 3D films also point to the fact that the digital 3D technology is more reliable than previous kinds of 3D and that more theaters have made the conversion to digital 3D projection than was the case with earlier incarnations of 3D. Most importantly, however, it is argued that the current wave of 3D is not at all about the big screen, but rather the small screen(s). Thomas Elsaesser has presented this argument most forcefully, claiming that promoting “3-D on the big screen today would then be a way of investing in 3-D on the small screen tomorrow” (Elsaesser 2013: 228). We are certainly seeing more and more (small) 3D screens and devices as time goes by (fig. 16). But will we really, as claimed by Sarah Atkinson, “soon be looking back nostalgically at two-dimensional ‘flatties’” (Atkinson 2011: 154), the same way that we look back at for instance silent cinema as a thing of the past? Is 3D bound to change the technological history of cinema as profoundly as did the addition of sound? In other words: arthouse cinemas only rarely have the equipment to project Adieu au langage, while multiplexes have no interest in the films of a film terrorist like Jean-Luc Godard. If 3D is indeed to become the new normal, 3D films will also have to flourish outside the mainstream – or even just outside Hollywood. As a non-mainstream, non-Hollywood 3D film, Adieu au langage has mostly been available on the festival circuit and the like until its release on Blu-ray 3D by Kino Lorber. However, watching the film on Blu-ray 3D at home on my 3D TV does not appear to offer the complete experience, with the images only receding in the depth of the screen and not at all protruding into my living room. So even if digital 3D is all about the small screens, there still seems to be quite a long way to go. Apart from arguing that digital 3D is as much about preparing 3D on smaller screens, Elsaesser also presents three other counternarratives in order to explain the resurgence of 3D. Elsaesser works from the general – and generally convincing – thesis that “3-D is only one element resetting our idea of what an image is” (Elsaesser 2013: 221). Of the three other counternarratives, the most compelling one is that digital 3-D is in fact mostly a supplement to surround sound. In other words, what the 3D image attempts to achieve visually is to give us the same experience of spatial depth that surround sound helps create. Sound fills space and surrounds us, being able to reach us from any of the 360 degrees around us, even from behind us. Fig. 17. 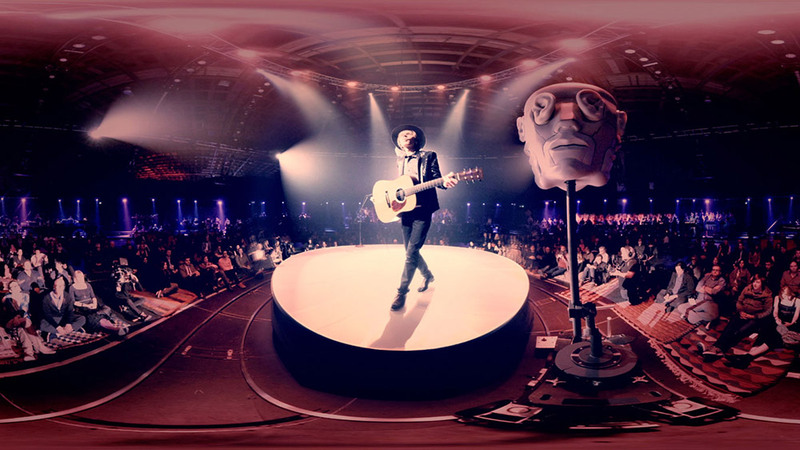 The 360 degree VR images of Chris Milk’s interactive Hello Again featuring Beck are as difficult to replicate in 2D as Godard’s 3D separation above. Adieu au langage, 2014, Jean-Luc Godard. The Avengers, 2012, Joss Whedon. Bolt, 2008, Chris Williams & Byron Howard. Bwana Devil, 1952, Arch Oboler. Cave of Forgotten Dreams, 2010, Werner Herzog. Hello Again, 2013, Chris Milk. The Hobbit: An Unexpected Journey, 2012, Peter Jackson. The Hobbit: The Battle of the Five Armies, 2014, Peter Jackson. The Hobbit: The Desolation of Smaug, 2013, Peter Jackson. How to Train Your Dragon, 2010, Chris Sanders & Dean DeBlois. Jupiter Ascending, 2015, The Wachowskis. Jurassic World, 2015, Colin Trevorrow. Les trois désastres, 2013, Jean-Luc Godard. Monsters vs. Aliens, 2009, Conrad Vernon & Rob Letterman. 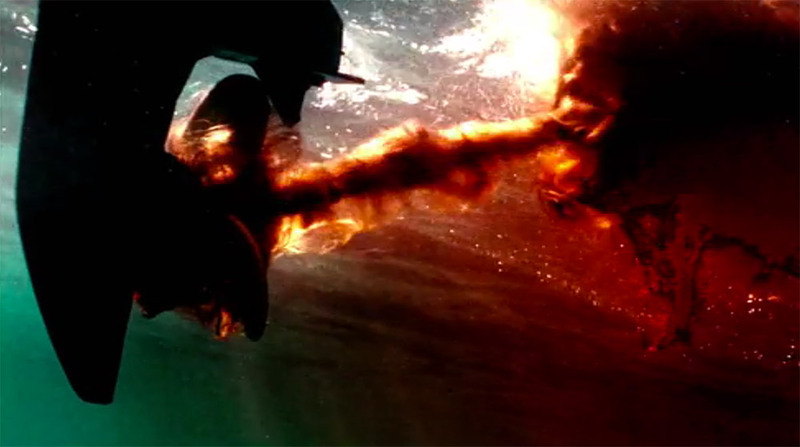 Piranha 3D, 2010, Alexandre Aja. Star Wars: The Force Awakens, 2015, J. J. Abrams. Tangled, 2010, Nathan Greno & Byron Howard. Titanic 3D, 2012, James Cameron. Toy Story 3, 2010, Lee Unkrich. Transformers: Dark of the Moon, 2011, Michael Bay. Atkinson, Sarah (2011): “Stereoscopic-3D Storytelling – Rethinking the Conventions, Grammar and Aesthetics of a New Medium”, Journal of Media Practice, 12:2, pp.139-156. Bailey, John (2014): “Godard and Goodbye to Language”, The American Society of Cinematographers, blog, 1/12/2014. Bordwell, David (2014): ”Adieu au langage. 2 + 2 x 3D”, Observations on Film Art, 7/9/2014. Chang, Justin (2014): “Why Godard’s ‘Goodbye to Language’ Demands a Wider 3D Release”, Variety, 4/11/2014. Dallas, Paul (2014): “1 +1 = 3”, Film Comment, 50:6, November/December, pp. 38-39. Desbois, Erwan (2014): ”Film terrorisme: Ah dieux, Oh langage (et un chien)”, Accréds: L’actualité des festivals de cinéma, 22/05/2014. Dixon, Wheeler Winston (1997): The Films of Jean-Luc Godard. Albany: State University of New York Press. Elsaesser, Thomas (2013): “The ‘Return’ of 3-D: On Some of the Logics and Genealogies of the Image in the Twenty-First Century”, Critical Inquiry, no. 39, pp. 217-246. Fairfax, Daniel (2015): ”Montage in 3D Cinema: the Case of Jean-Luc Godard’s Adieu au langage”, in Cinema Journal’s online section ”Afterthoughts and Postscripts”, Winter 2015, 54:2. 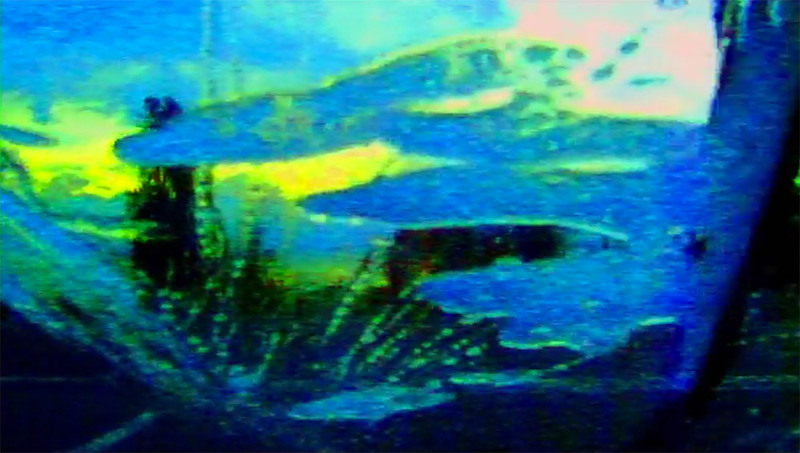 Flueckiger, Barbara (2012): “Aesthetics of Stereoscopic Cinema”, Projections, 6:1, pp. 101-122. 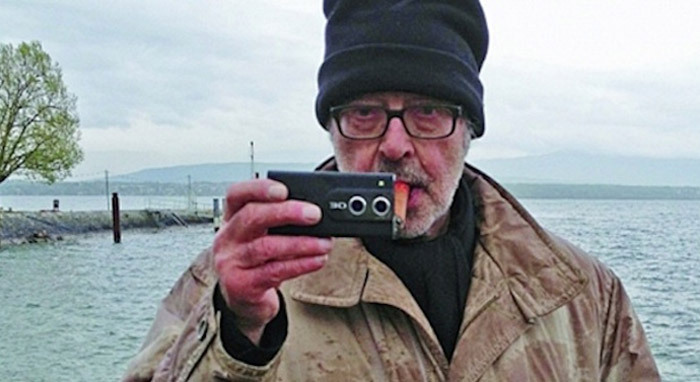 Frazer, Bryant (2014): ”Five Ways Jean-Luc Godard Breaks the 3D Rules in Farewell to Language”, Studio Daily, 3/10/2014. King, Geoff (2002): New Hollywood Cinema: An Introduction, London & New York: I. B. Tauris. Klinger, Barbara (2013): “Three-Dimensional Cinema: The New Normal”, Convergence: The International Journal of Research into New Media, 19:4, pp. 423-431. Mella, Cécile (2015): ”In Conversation with Jean-Luc Godard. Filmmaker Extraordinaire”, video interview, CPN: Canon Professional Network. Morgan, Daniel (2012): Late Godard and the Possibilities of Cinema, Berkeley, Los Angeles & London: University of California Press. Morrey, Douglas (2005): Jean-Luc Godard, Manchester: Manchester University Press. Neupert, Richard (2002): A History of the French New Wave Cinema, Madison: The University of Wisconsin Press. 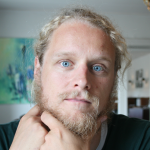 Rasmussen, Lasse Kyed (2006): ”Filmen mellem linjerne. Mellemtekster i Jean-Luc Godards Weekend”, Kosmorama, #238, pp. 85-95. Romney, Jonathan (2014): ”Film of the Week: Goodbye to Language”, Film Comment, blog, 29/10/2014. Ross, Miriam (2013): “Stereoscopic Visuality: Where Is the Screen?”, Convergence: The International Journal of Research into New Media, 19:4, pp. 406-414. Ross, Miriam (2014): ”Goodbye to Language 3D: Painful Sight”, Miriamruthross: Cinema Lives Cinema Loves, 6/8/2014. Sterritt, David (1999): The Films of Jean-Luc Godard: Seeing the Invisible, New York: Cambridge University Press. Susman, Gary (2013): “Can ‘Gravity’ Save 3D?”, Rolling Stone, 12/10/2013. Taubin, Amy (2014): “Dog Days”, Film Comment, 50:4, July/August, pp. 48-51. Zone, Ray (2007): Stereoscopic Cinema and the Origins of 3-D Film, 1838-1952, Lexington: The University Press of Kentucky.